Prepare to become the ultimate Marvel Fan with Marvel Unlimited Plus! A new initiative that takes the massively popular Marvel Unlimited to the next level, this exciting new membership tier is your all-access pass to the Marvel Universe and more! 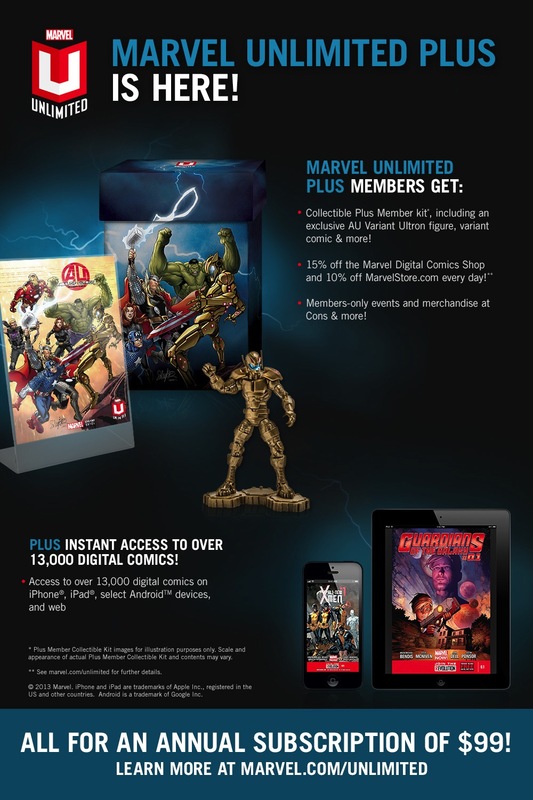 As well as gaining access to thousands of classic and newer Marvel digital comics, Marvel Unlimited Plus members cement their place as true members of the Marvel Universe, gaining unprecedented entry to their favorite characters, creators, merchandise, and more! Instant Access To Over 13,000 Digital Comics – Thousands of digital comics for the iPhone, iPad, select Android devices and the web, so you can jump in on your favorite Marvel adventures, anytime, anywhere. Benefits and Perks – Access to breaking Marvel news as it goes to major news outlets! Factor in a 15% discount at the Marvel Digital Comics Shop and 10% off discount every day atMarvelStore.com, there’s nothing stopping you from getting the best of what Marvel has to offer.